College Signing Day: Supporting Student Success! Again this year, we were thrilled to support and be part of College Signing Day in Philadelphia on May 2. 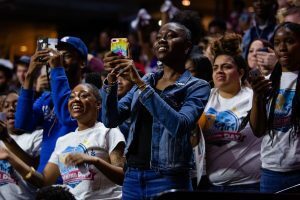 As in the past, Michelle Obama joined 7,000 Philadelphia high school students, along with celebrities and athletes to celebrate the pursuit of higher education. 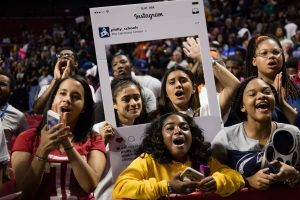 According to our friend and supporter at Civic Nation, Eric Waldo, the event “went from a few dozen College Signing Days in 2014 to 600 in 2015; then 1,200 in 2016; 1,500 in 2017; and now over 2,000 events in 2018.” As a first-generation college graduate and current graduate student, I was proud to represent ACT and our mission of helping people achieve education and workplace success this College Signing Day. Summer melt is the occurrence of prospective college students’ motivation to attend college “melting” away during the summer between the end of high school and beginning of college. Research indicates that 10-44 percent of students accepted to college who intend to go, do not actually make it. That’s nearly one in five students, and it affects low-income, first-generation college students even more. How can we help? creating a community of support for students and work together with them on the difficult transition from high school to higher education. Of course, the work doesn’t stop there. You can explore more resources to support students in their transitions to higher education at Steps2College.org. Check out this free eBook to help navigate the financial aid process or National College Access Network’s #FormYourFuture campaign. Want to chat more about how you and your organization can help? We invite you to join the #SummerMelt Twitter Chat on May 22, hosted by our friends at the American College Access Campaign. See you there!